Answered by John Zannis, M.D. I have dry skin and brown spots after my IPL treatment, is this normal? I just got an IPL treatment 5 days ago and my skin is extremely dry and my brown spots are more noticeable, is that normal? Does an IPL/PhotoFacial tighten sagging skin? As above, does IPL/PhotoFacial also tighten your skin or does that call for a different procedure? Is it normal to have breakouts 4 days after my first IPL treatment? I had my first IPL treatment for facial redness and broken veins. 4 days since my first treatment and I've had breakouts of pimples. i havent had such a breakout since my teens im in my mid 30s now. What is the difference between Broadband Light Photo Rejuvenation and IPL? 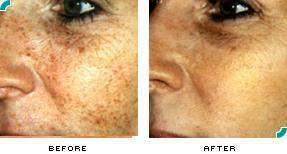 Is there a difference between Broadband Light Photo Rejuvenation and IPL, or are they the same? Why can't I use moisturizers on my face after IPL treatment? I was told that I may dab a little Vaseline on the crusted spots only. What else can I use? Can the IPL treatment cause damage to your skin? I had my first IPL treatment and have many red marks that still hurt some along my jaw line. I also had a few areas that swelled up, then the skin peeled leaving a scab. I have one that looks like a long scratch, and some say a scar. Does Fotofacial/IPL treatments cause cancer? Have studies been done to show whether IPL or other light-based skin rejuvenation procedures raise the likelihood of melanoma? Does IPL treat acne scars? Does IPL treat acne scars and is that the most effective way to treat acne scars? Is there a link between Intense Pulsed Light therapy (IPL) and fat loss? I heard that in some patients, IPL can cause fat atrophy in facial structures, causing a hollowness of the cheeks. Is this true, and if so, how could this happen? What is the difference between IPL and ematrix for removing lines? Is Fotofacial/IPL the best for wrinkles in the eye area? Is IPL or Fraxel better for reducing fine lines and eye wrinkles? I have pretty noticeable crow's feet. Recently had terrible reaction to Photofacial, could it have burned the subdermal layer and caused permanent damage? Have had PFs before (2), 4 weeks apart. I'm not using any new meds or face products, just a different tech. Luminesse laser, same settings caused my face to swell like a balloon, lumpy, and red almost like histamine reaction. 4 days later, prednisone & still not fixed. HELP! Is IPL or Laser Resurfacing the best procedure for rosacea? I am looking into options to reduce my rosacea symptoms (redness, scars, bumps) and to improve the appearance of my skin. I am looking at the IPL or the combo IPL+Laser. Is it safe to have an ipl, microdermabration, and chemical peel all in the same visit?